The patient, a 27 year old woman came for a consultation due to digestive problems. Peter (P): What is your problem? Mrs K: “Ever since childhood, I have had a distended belly, tummy aches, and constipation, but for the last two years my digestive system is really my weak point. I have stitches in my abdomen and it hurts to have stools; I can feel them sitting there. For the last few years, I have stopped drinking coffee; if I try to drink it I get problems. I like to have wine but I get problems from that, too. It is all worse with stress. In March 2007, I ended up in the hospital’s emergency department because of terrible intestinal pain. I had eaten lasagne and within five minutes I had emptied my bowels in the toilet. The pain was terrible, especially in my upper belly; it was as if I had lots of little knives underneath my skin, and because of the pain it was difficult to breathe, so I started to hyperventilate. In the days before this episode, I was often having problems after the evening meal; cramps and stitches in my stomach and belly, as well as very watery and rapid stools. On the way to the hospital, the pain in my bowels lessened but the pain in my stomach remained. Blood and urine were both normal. An echography and an endoscopy of the stomach and abdomen were carried out but nothing untoward was found and I was sent home with medication. Now, I drink 2 litres of fluid per day, I eat as much roughage as possible and I cook with fewer spices. I don’t drink alcohol at all anymore. The cramps in my belly have lessened but my belly still swells up regularly and, despite taking Pantazol, twice daily, I still have lots of burps and eructations from my stomach. My stomach still feels very painful; it is a nagging pain, a bruised feeling. I also have pain in my lower belly when I am passing stools, as though it is drawing a vacuum. Since 2004, I also have problems with stomach acidity; I have used Ranitidine for a long time. I have a sour burning from my stomach to my throat, and burping. P: Can you tell me more about what was happening at the end of March, when you ended up in hospital? P: Can you describe that feeling even more? P: (I ask more about the points and the pain, but there is no more information available). You say that stress can play a role. Has anything happened at the end of March that could have to do with it? P : (I ask more about the ‘vacuum’ feeling, it feels like a blow). You say that the complaints ‘attack’ you? P: What do you mean by “my energy is all knotted up”? P: No solid ground under your feet? P: Can you describe that feeling of being ‘felled’? P: Someone who you lean against is not there and you fall on your face. How do you experience that? Can you describe that further? P: It blasts into you, you can’t push it away...? P: Describe that feeling even more to me. P: Could you tell me more about dissociating? P: What is this world that doesn’t come in anymore? Can you describe that? P: Can you describe how you experience, as precisely as possible, when the world doesn’t come in anymore and there is nothing to hear, nothing to feel? What is you sensation? I was almost divorced. I felt closed in, she was always in my space, she claimed my space. I had to pull myself away. I couldn’t move; “get out of my way!” I feel even smaller, I have no defence, no air, my living space is taken away, and there is no room for me. I am suffocating, constricted, under water, screaming but no one hears me!” (At this moment she gets a pain in her belly). P: The customs officers should come in between? P: Tell me about dreams? “Crowds of people; like at a pop concert, where everyone pushes against each other. I feel every elbow, the space becomes smaller and smaller, I have the tendency to thrash my way through. Mrs K has studied Dutch and business communication. She teaches at a poly-technical school. She has had a turbulent year: a divorce, a new girlfriend, a new job, due to losing her old job. She has gone into local politics. At the moment, she has no house and she is living with her partner. She continued to have the feeling of having no solid ground under her feet, and she spent two weeks at home with high fevers. She was completely in her head. An important life event for her was the divorce of her parents: she didn’t have any contact with her father for 25 years. The only recognition she could have received would have been from her mother, but she never really got that from her. She is jealous of the bond that her sister and her mother have; she has always felt left out. Due to this lack of recognition she felt she couldn’t be herself. She had to fight to be herself, to be strong enough. She says that she is sensitive and open. She can’t stand it if ‘patterns don’t correspond’, that is, if things don’t go the way she thinks they should. She has been to a gastro-enterologist several times for her digestive problems and she has had various tests done. She has used laxatives and fibre-rich foods but that has not helped. Irritable bowel syndrome has been considered, as well as Crohn’s disease, since she used to have blood in her stools. She has also tried haptonomy with no success. She has had a sort of abrasion of her face, with wound fluid coming out of it. She regularly has aphthae in her mouth; on inspection she now has aphthae. In the past she has had blood in her stools. To solve this case, I have used Rajan Sankaran’s method, making use of the sensations. The problem of the minerals is that they experience their structure as being incomplete, or that they fear to lose their sense of completeness. Something inside oneself (a projection of the inner world onto the outer world) is lost or is incomplete, which does not seem to be the issue here. With animals we often see different sensations, which have to do with survival and competition, which does not seem to be case either with Mrs K. There is no clear aggressor; she speaks of her girlfriend as someone who is in her space, then she talks about “sensations that thud straight into her core”, something that simply happens to her. In her case, it is about one sensation and its opposite (see the explanation further in the text). She talks about sensitivity and about something that happens to her. Considering these aspects, it is clear to me that she needs a plant remedy. Which plant family is it? In the first instance I thought of the Asteraceae family (formerly called the Compositae), because of the blunt objects, the thuds, the bruised feeling, the feeling of receiving blows in a boxing ring, the feeling of having little immunity, and high fevers. What is her sensation? At a moment that she is not expecting it, when she thinks that she has everything under control, she feels attacked by stimuli from the outside: by a hit, a slap, or a stab. It bangs straight into her, right into her core, razor-sharp, and it radiates throughout her body, it flies through her body. 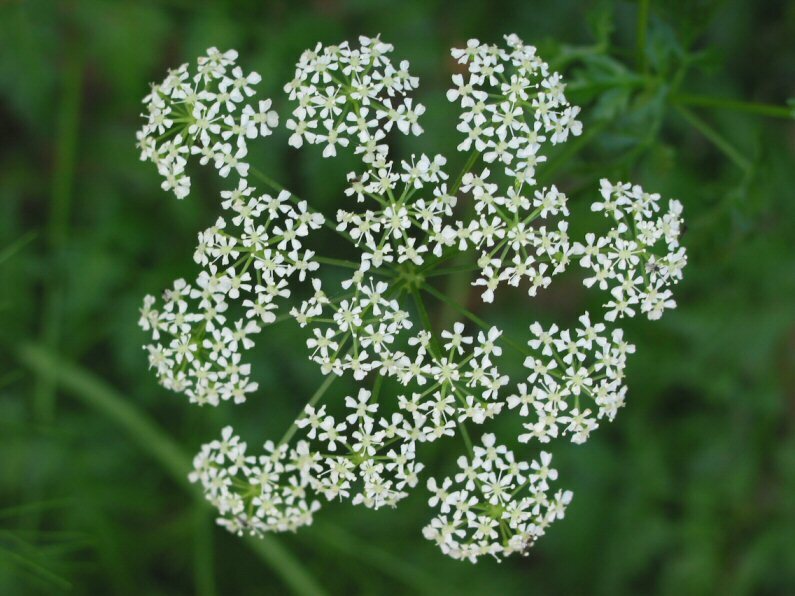 This is the sensation of the Apiaceae family (formerly called the Umbelliferae). Sankaran uses the following words to describe the sensation of this family: “sudden unexpected violence or attack, accidents, blows, riots, stab, wound stabbing pains, lancinating pains, preparing for a blow” (buffer cushion, call the customs officers!) Her response is to dissociate, to glide away, or to shut herself off from the outer world’ stimuli. Sankaran describes the opposite sensation of compensation with the words: paralysis, stupefaction, dullness, sleep, calmness. With the Asteraceae we do not see that sudden, unexpected aspect. The aspect of “suddenly being attacked by an overwhelming stimulus” is typical for the Apiaceae. The insights of Jan Scholten also support the choice of this family. His description of the situation of the Apiaceae (Plant Seminar 5, May 2003) is applicable in this case. They have a need for control, they are thinkers, and they can shut out the contact with the emotions and the body. They can suppress their sexual energy. Their senses are well developed (our patient sees and hears everything, she sees all sorts of details). They have a need for dark (she can shut herself off while walking in the woods). There is often a distant relationship with the mother, which can be expressed by an aversion to, or an aggravation from, milk. She describes that her body encapsulates the bullet: induration (hardening) of tissues (glands, tumours, breast cancer) fits the Conium picture. She is doing well at all levels; she feels stronger. For the first time ever, she has gone to Germany alone on vacation, something that she would never have dared to do before because she was so ‘wobbly’. She ‘just stands’ and experiences herself as being grounded, earthed. The world no longer goes through her, things don’t simply overcome her anymore, and she does not let herself be dragged along by her emotions. One week after taking Conium, she has had black coffee for the first time in three years and had no problems with it. She no longer needs to watch what she eats; she can eat spicy and fatty food. She can also enjoy wine with no problems; in the past she would have had sour eructation. Her stools are only sporadically painful and irregular; in any case much better than they have been and they no longer have an offensive smell. Belly cramps are gone, as are flatulence and burping. On pressing her belly, she no longer feels as though her bowels are sliding. Prescription: repeat Conium maculatum MK. After taking the remedy, she had an initial aggravation; some pain in the bowels and a wobbly feeling. A few days later, she is doing well again, even better than before. She feels very well, light, strong, and stable. If she drinks too much coffee, she has some problems but apart from that she has no problems at all. The aphthae have completely gone. She used to have the sensation of “receiving a blow” every day, now she says that she never has it. I arrange with her to repeat Conium if she has a relapse, or if she has any other complaints, and to call me if necessary. I wrote to her GP, and then realised that I had not asked her what she was doing with the medication that had been prescribed (Patnazol, Ranitidine), so I phoned her to find out. She had stopped it all on her own, all that she has needed during this time has been one dose of Conium. It was still going "amazingly well" with her. What was, in fact, this patient’s problem and what is the essence of “the sensation”? Because I found the remedy so quickly, following Sankaran’s method, some emotional and situational aspects have not been touched on. One could say that the main problem was, in fact, the sensation, but what is actually “the sensation”, or, better said, what is the essence of “the vital sensation”, as Sankaran calls it? Sankaran describes it as a non-human energy, something that changes the life principle of the organism, and which is experienced as an abnormal sensation (The Sensation in Homeopathy, page 421). Through the interference of this energy with the life principle, all activities and psychological processes take on another quality. It is as though the person is wearing a pair of yellow glasses; everything that he/she sees is then described as yellow (Sensation Refined, page 53). The pattern of the energy corresponds with that of the source (the remedy). Sankaran states explicitly that the vital sensation is the deepest and most constant experience of the person; the principle that binds body and psyche. I draw from this the conclusion that this principle is of a higher order than body and psyche, which would be logical if the sensation manifests itself at the level of the life principle. The assumption that the vital sensation is the deepest experience is acceptable, given that every entrance in the anamnesis leads to the same point, but does this imply that the vital sensation is, therefore, necessarily a higher instance that the psyche? Although Sankaran approaches the concept of the sensation pragmatically, and does not go further into it, his description makes me think of the sensation as an invasive energy, one that disrupts the system: “A plant or animal lives within” (Sensation Refined, page 53); “illness is a song of something else that plays inside us” (Bert Lefevre, Ingrid van de Vel, Seminar SHO 2006)”. So, does the sensation have to do with an external energy and if so, how does this energy come in? Or, could this sensation come from inside? When we consider mind over matter, we could consider the sensation to be the projection of a mental image or film onto the person’s emotional and physical levels? Could we then consider this mental image to represent the central problem of that person? Could that image follow a pattern that resonates with some other energy in nature, implying, perhaps, that the image of the psyche is of a higher order than the sensation? If I bring the experience of the sensation of our patient back to the mental level, then I could propose her central mental concept as that which, in this life, overcomes her as a shock, and with that which she cannot deal with, because she is so sensitive and so quickly thrown off balance. One could also ponder on the relevance of understanding precisely what the essence of the vital sensation is, since Sankaran’s beautiful method is useful and workable without being understood. After all, ultimate reality is not to be understood rationally. Perhaps the vital sensation cannot be understood at all because it is, indeed, a higher principle than our mind cannot grasp. Thank you for your lovely case and the interesting reflections. I have wondered if the phenomenon called a vital sensation could be seen from still another point of view and have looked in the Organon. First I'd like to say that our philosophy is largely based on our understanding of the Organon, and there are resulting errors due to a change in the meaning of certain words in the original and some inexactness in translations. So if we work this up, things might become clearer. (On such issues I have elaborated in an article that is now published in Homoeopathic Links). Hahnemann says the vital force is deranged by a "morbific agent inimical to life; it is only the vital principle, DERANGED to such an abnormal state, that can furnish the organism with its DISAGREEABLE SENSATIONS..." (aphorism 11, Boericke-edition, my emphasis). What is a morbific agent, why is it inimical to life and what kind of sensations does he talk about? If a morbific agent comes from the outside, there might be a trauma or an epidemic disease; if from the inside, there might be a main issue with the patient (like confusion about identity). It is inimical to life as it hinders our development as a blockage. It could lead to an internally altered vibrational pattern (inner alteration of the dynamis) which is then ex-pressed by means of morbid symptoms, signs, phenomena "which are FELT by the patient himself"... etc (aph 6)- and sensations are felt by the patient. A vital sensation is certainly felt on a deeper inner level than is a mere physical sensation like bruised after an accident. Such phenomena were not completely unknown to the old homeopaths; they already used As-if-Symptoms (compare level 5 in Sensation method), and with Boenninghausens Pocket Book we repertorise sensations running through the case (e.g. like a ball in inner parts, wie eine Kugel in inneren Teilen, my translation). What is striking is that the sensations in your case are disagreeable indeed (e.g. razor-sharp, bruised etc), and so are other sensations we know from remedies (e.g. constriction, stiffness). In a completely healthy state we would not expect such disagreeable sensations. They are restricting, and in cure the patient should get rid of what thus restricts him or her. And in health the vital force "retains all parts of the organism in admirable, harmonious, vital operation, as regards both sensations and functions,"(aph 9) so there should no longer be an inharmonious sensation. So I'd expect that in cure a disturbing vital sensation would diminish and maybe finally disappear - whereas the psyche still exists and gets more freedom - so what is the higher principle? i.e. the vital sensation would belong to the diseased state in the patient? But don't we treat the patient and not the disease? In the light of the Organon we treat the person in this way that an inner disease state is shown by means of symptoms THROUGHOUT the whole person, but is not the whole of the person, and by curing the DERANGED vital force, the symptoms disappear. It is as if repairing a software defect that causes various disturbances in a computer, but is not the whole of the computer. The other software needs no repair. So far my conclusions; I'd suggest to just make use of what works, although we may not yet fully explain everything. Thanks for a beautiful case and a very clear discussion of the differentiation between Asteracea and Apiaceae sensation. Your reflections at the end are timely for me as I have been reviewing my understanding of Immanuel Kant&apos;s Critique of Pure Reason this weekend! What can we really know about the nature of reality from reason alone? And what can we know about things outside of ourselves? Kant, whose life overlapped with that of Hahnemann, in some ways was also incredibly ahead of his time in terms of his understanding of the importance of how the mind shapes reality. He understood that the very concepts with which we frame questions and view the world influences our perceptions and experiences. If we think of the Vital Sensation as something deeper than Mind and Body, but not "higher" or "beyond" it, it is helpful. It is a ground of experience, in a way, with mind and body then being two sides of the same phenomenom. The sensation shapes the morphogenesis/experience of the mind AND the body simultaneously. It does not come from outside or from inside, as there is no outside or inside. The phenomenom just IS. We are so fortunate to have thinkers like Sankaran and Scholten to help us understand better what we are doing; ultimately it is our patients like Mrs. K who benefit! One of the most exciting things about practicing homeopathy is that each day gives an opportunity to experience afresh the hidden, mysterious, and deep nature of reality. If Kant could spend a few days in our consulting rooms, would he have changed his Critique of Pure Reason? What, really, can we know about Reality? Something to wonder about! Thank you very much for this well elaborated case of conium! I really enjoyed reading your case of Conium, Peter. It has helped me regard Conium in a different way and given me some helpful information. There are a couple of cases I have been struggling with for a while and I feel that this has given me some valuable insights. Many thanks.